March 19, 2008 By Captain Jim Polan & filed under All Articles, Other Tactics & Training, Tactics/Training. Training must be continuous and ongoing. Instructors and students must be willing to learn new information without any fear of change. The best officers and teams are the best trained. SWAT teams must have the best training possible. If you follow the six “Rs” of training, they will assist you in providing a successful training program. 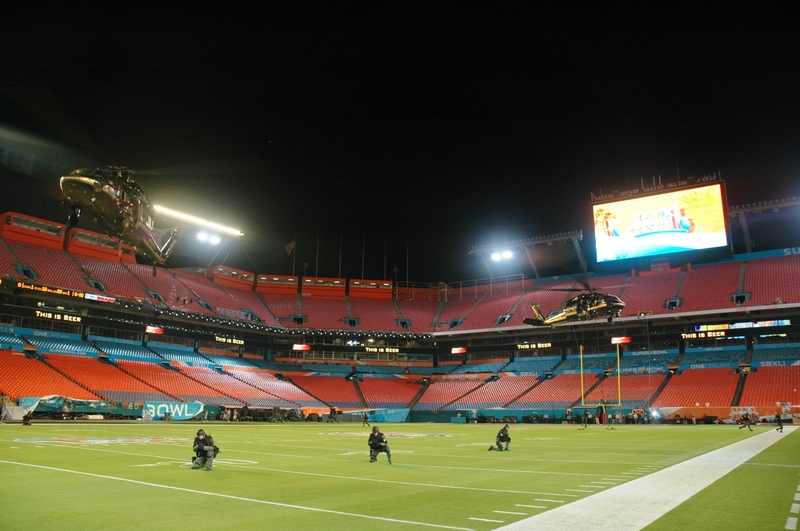 Broward County was co-host to Super Bowl XLI and worked closely with Miami-Dade Police Department SRT on preparation. 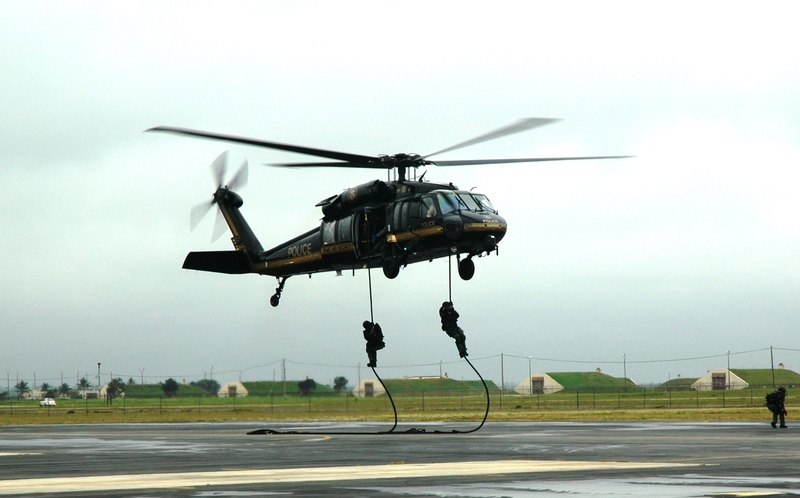 Agile Blackhawk helicopters aid team members as they fast-rope into possibly dangerous situation. Recent: The objectives provided must be recent in the SWAT community. Instructing SWAT members on using a revolver for entry would not be recent, but using a 40mm launcher would apply. Relevant: Training must be relevant to the job. Instructing SWAT on how to conduct an unknown risk vehicle stop would not be relevant, but how to safety conduct a vehicle assault would. Repetition: Students must perform the task over and over again to understand it and feel confident in their ability. There may not be any time to react; therefore, it must be instinctive. Realism: Make it real. 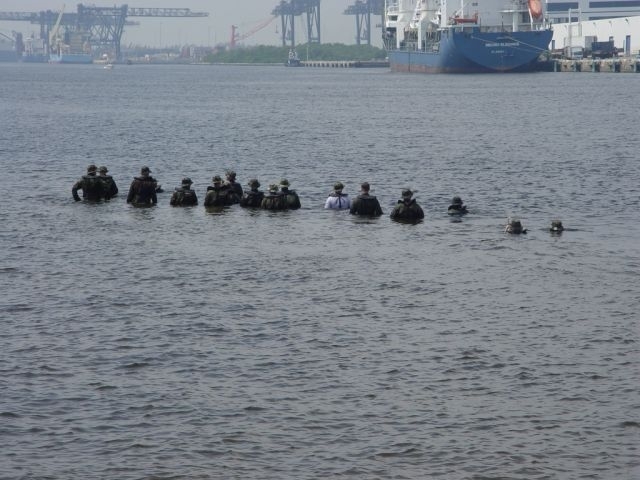 Provide water survival drills while wearing issued SWAT gear or provide continuous exposure to chemical agents with and without a protective mask to instill a level of confidence and reduce the possibility of panic during a mission if something goes wrong. Review: Provide immediate feedback on performance. The good, the bad and the ugly. Responsibility: This very well could be the most important of all six. The members must realize that the training they receive is only valuable if they believe and continue to practice. It is their responsibility to train. SWAT trainers have an unbelievable responsibility to develop and provide basic and in-service training. This training can be developed from various resources, personal knowledge and experience. The standards of the industry must be followed and used as guidelines during course development. 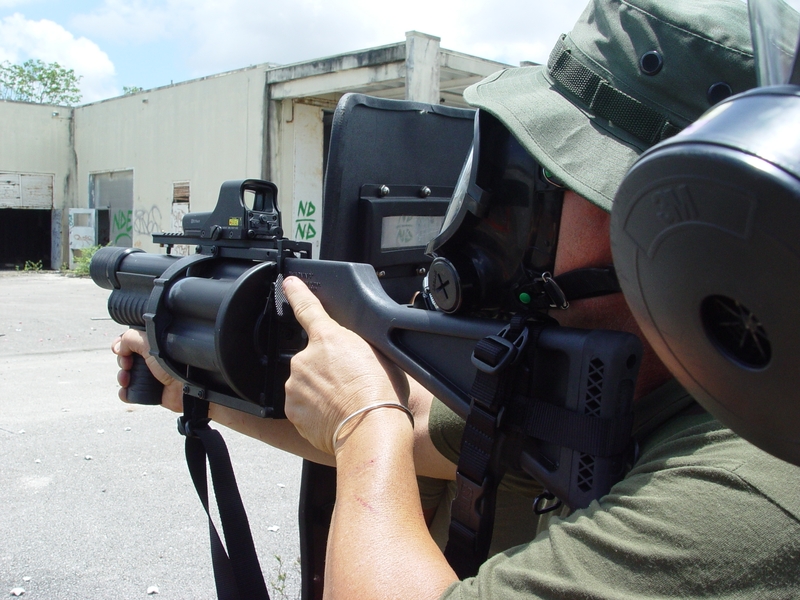 Attending various courses and joining your state SWAT association and the National Tactical Officers Association (NTOA) are of great value. Every team should have a training coordinator (TC) who provides the calendar plan of action for the upcoming year. This blueprint for success will provide guidance for the entire year for scheduling of officers, ranges and other resources to facilitate training. This coordinator carries a great deal of responsibility; therefore, the TC must be awarded the authority to carry out the assignment. This position should not be awarded due to member’s rank or position but their ability, skill and knowledge to complete the task. Broward County is surrounded by water: Atlantic Ocean, Intracoastal waterways, New River, Everglades and thousands of family pools. Team members are challenged while in the water: falling into water in full gear, treading water and of course swimming under adverse conditions. The mindset of “If it’s not broken, why fix it?” does not belong in law enforcement training. Choosing the right instructors is far more important than the quality of the lesson plans. Instructors do not have to be experts in the topic, but they must have the knowledge to deliver the information in a positive learning environment. SWAT trainers must believe in what they are teaching and practice what they demonstrate. Experienced trainers realize that they too will learn while instructing and must be prepared for student review. The student may provide a better way of conducting a specific task that is being taught and the instructor may learn from that student. Remember there is no “best” or “only” way to conduct a certain method or tactic, but always another way to perform the same level of instruction. Broward Sheriff’s Office (BSO) provides law enforcement to Fort Lauderdale/Hollywood International Airport, and trains for incidents involving aircraft. Trainers and the TC can follow a few simple rules while developing lesson plans with successful objectives. First identify the goal or scope of the lesson plan, and then list all objectives to be accomplished. You must then decide how the objectives will be tested. One way is to have the students demonstrate the task that is being taught. Another way is to administer a written test. Even better is a combination of both. Explain to the students what is to be accomplished and allow questions and feedback. However, unless feedback is a safety issue, it must be limited or the focus on the issue will be lost. Demonstrate the task by drawing on a white board, giving a Power Point presentation or showing a practical application. Imitate what the trainer has explained and demonstrated with practical application. Practice the objective the correct way, with multiple repetitions until the student and trainer are confident in their performance. Each lesson plan should be issued with a specific number, to make documentation and tracking much easier for all involved. For example: The first letter could identify the topic: F-Firearms, T-Tactics, and so on, followed by an assigned number. For example, one-handed shooting could be assigned F01 and Downed Officer Rescue T01, and then continue with the number of lesson plans that are being used. Once a recording system is identified, keep a SWAT Lesson Plan library. This valuable reference material will have all documented lesson plans with a cover sheet identifying all approved lesson plans and numbers. Broward County’s western edge is the Everglades. Here small unit tactics are practiced. Attendance Roster: Who was present and why others were not in training. Date/Day/Time: Don’t forget about low-light and darkness training. The students will validate the lesson plan by their individual performance. Upon completion of each training session, trainers must evaluate the objectives that were provided to the team and make fair, honest decisions about whether the objectives were realized or not. If changes are needed, make them! 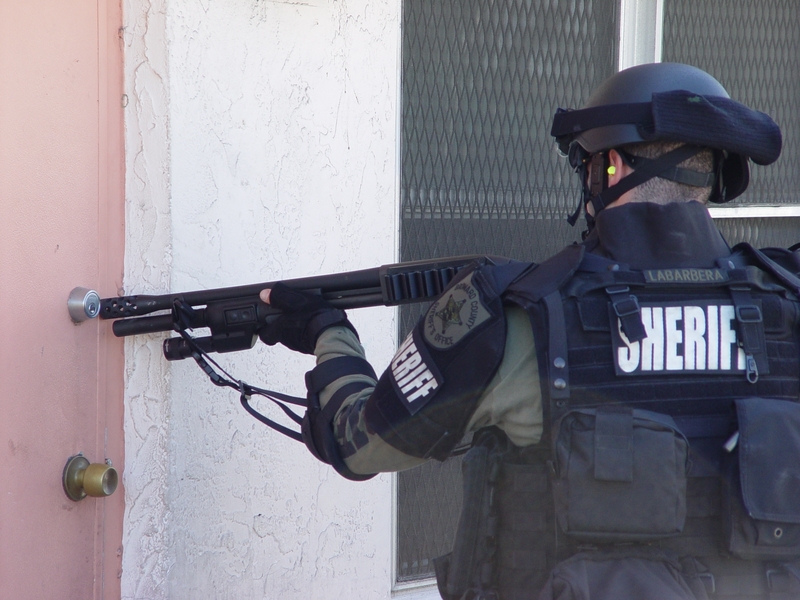 There are many ways to breach a door or locking device, and the BSO SWAT team makes a strong attempt to have as many resources as possible in the toolbox. Shotlocks is one of those resources that requires continuous training. Locating a vacant structure soon to be demolished is worth a fortune for a team to practice. In addition to the lesson plan library, develop a book of resources on various articles that identify different methods of instruction. Divide those into categories: Administration, Breaching, Explosive Entry, Legal, Firearms, etc. This book can be a valuable resource when you are preparing other training plans or it can be used for justification to administration if you are making an attempt to improve your current level of training or standard operating procedure. There is no doubt that the lesson plan library and the book of resources will be valuable sources of information and, if required to justify any actions, the answers are only your bookcase away. A good plan today is much better than a perfect plan tomorrow. While using protective cover, team member practices deployment of 40mm chemical agents into abandoned building. Criminals armed with superior firearms and body armor. Larger and more organized street gangs. Mass transit in Broward County is used extensively. 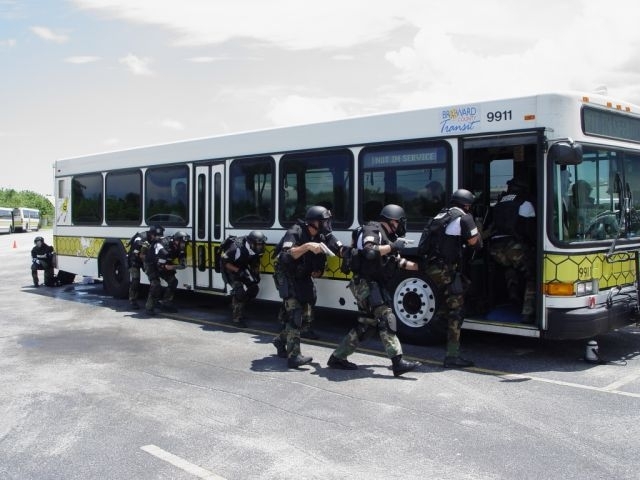 Whether it’s a county bus, school bus or interstate, SWAT team must prepare with knowledge and practice. The NTOA recommends a minimum of two days of training per month. 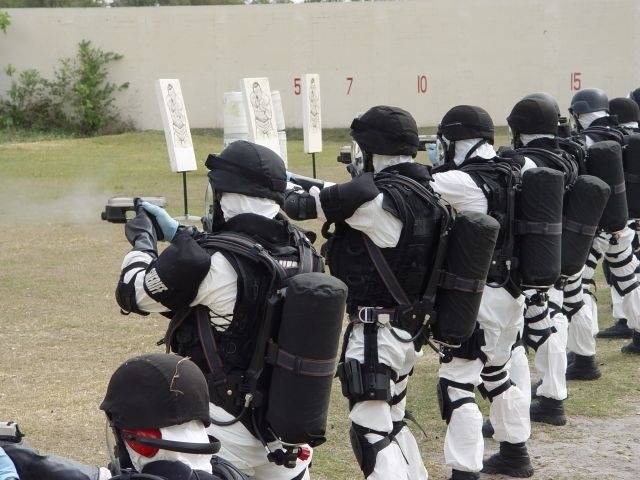 However, once the training calendar is drafted, the team will realize that two days each month is not acceptable to complete all the basic skills required for day-to-day SWAT operations. With society taking a different turn in law enforcement, training continues to be a challenge. Ten years ago, training for a Weapons of Mass Destruction incident was not an issue—today, preparations must be made. Firearms training, along with tactics and physical fitness, should all be viewed at the same level. All are equally important. One part of law enforcement that many never planned on was fighting terrorism. 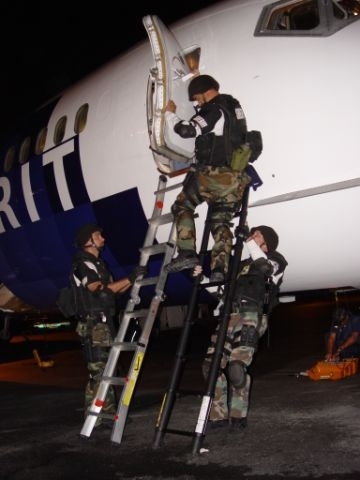 Since 9/11, many teams have been called upon to prepare for “what if” scenarios and conduct tactical operations while wearing various levels of personal protective equipment. It’s not good enough to just have the gear: the team must also train while wearing it. 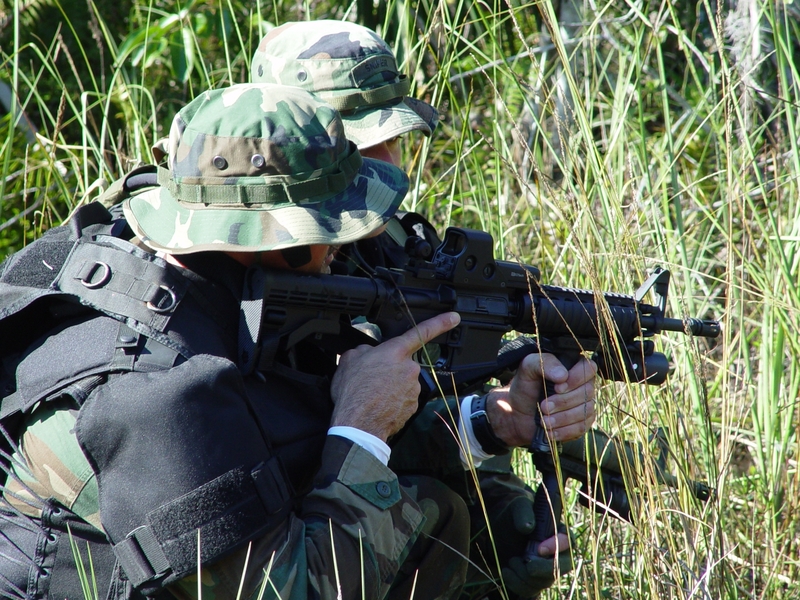 In-service SWAT training may be the most important function that a tactical team performs. Training is the foundation for a successful team. A study conducted by the NTOA proved that “SWAT saves lives,” and for that successful mission, the members must be prepared. To err is not an option.